I absolutely love it when spring comes around, it makes such a difference when you have little ones at home. My boys love spotting the daffodils and crocus on the school run and they get to have a good run around the garden. The only thing I don’t love is that there always seems to be a lot of rainy days this time of year. 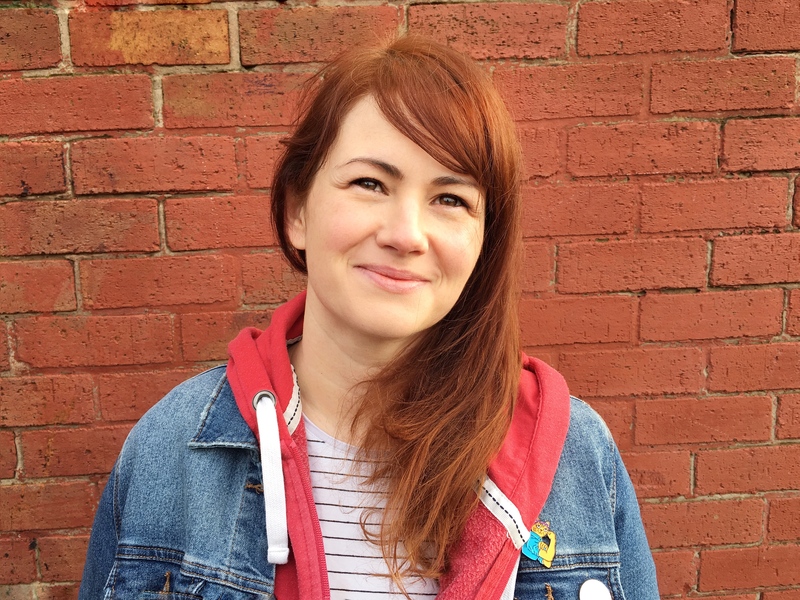 In fact we seem to be getting lovely sunny mornings and evenings and then grey skies throughout the day. The twins are so full of energy that when the bad weather hits we end up going stir crazy in the house. I’m not great at creating activities or doing crafty things with them and I hate feeling that the TV has been on all day. 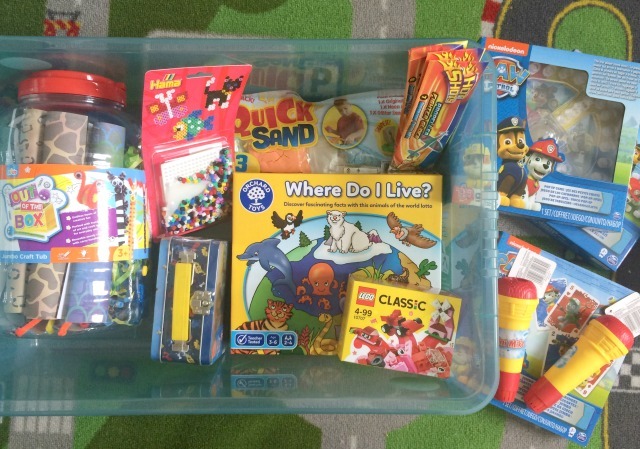 I always lack inspiration for what we can do next so I thought I’d put together a box of fun for rainy day. That way when we are stuck in the house and I’m at a loss at what to do next I can pull this box out and we can do a few of the things out of it. 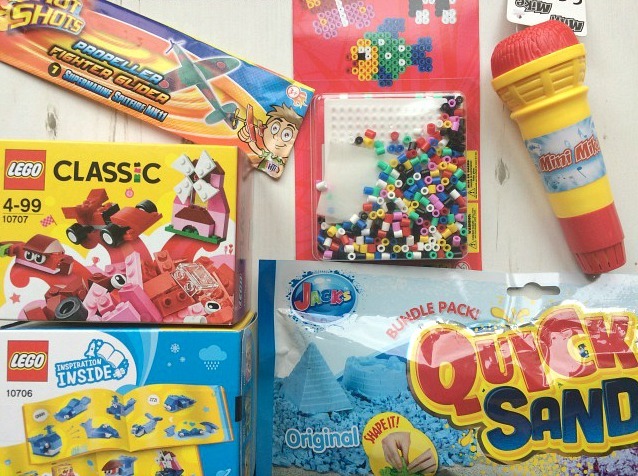 Before I went shopping I had a few ideas of what I wanted to buy – board games, crafts, card games etc. 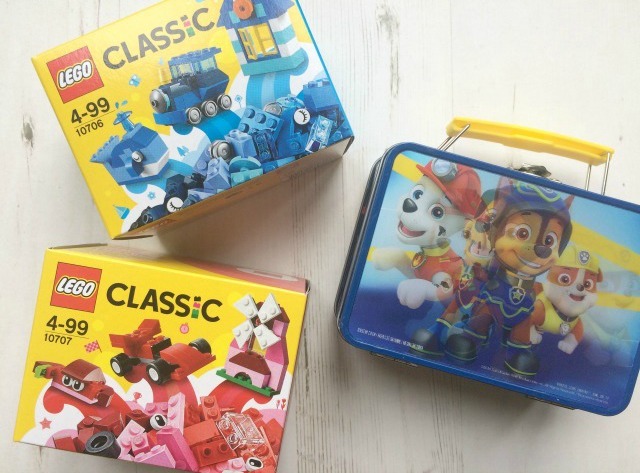 I went to the Coliseum Shopping Park with the twins and we popped into The Entertainer and Debenhams to see what I could rustle up. The Paw Patrol aisle in The Entertainer was the first thing we had to stop at, they just kept gravitating towards it but I did get a few little games and puzzles from there, including a matching cards game. In the end I left them there with my mum and went to find some other crafty bits. The Entertainer had so many craft activities! I hadn’t thought of looking in there before for things like that if I’m honest so I was impressed with the range. I bought a big craft tub, filled with paper, pipe cleaners, pom poms etc. Lucas sometimes asks if he can make things when he gets in from school and I panic as my mind goes blank. His imagination is so much better than mine that I think I’ll find it easier to pop all this in front of him and let him go nuts. 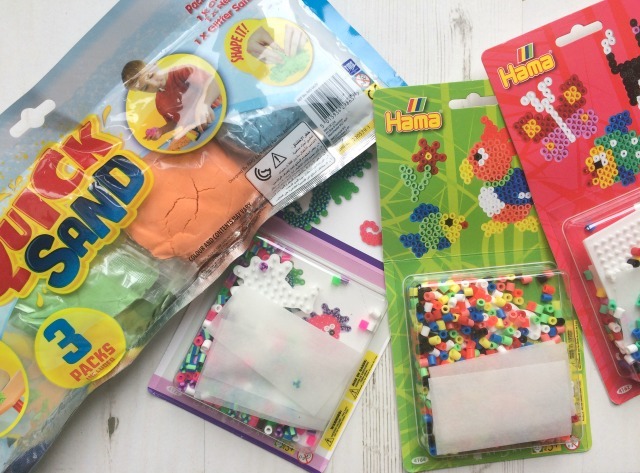 I also picked up some Hama beads, I haven’t tried these yet with the boys so I got them a little pack each to see how they get one with it. I also bought some kinetic sand, we had a little pack of this a few months ago and the boys went crazy for it. If you haven’t tried it yet it’s basically sand that you can mould – they had a great choice in The Entertainer and all quite reasonable. I put it in a big tray on the table and give them some toy diggers, it’s amazing how long it keeps them entertained for. 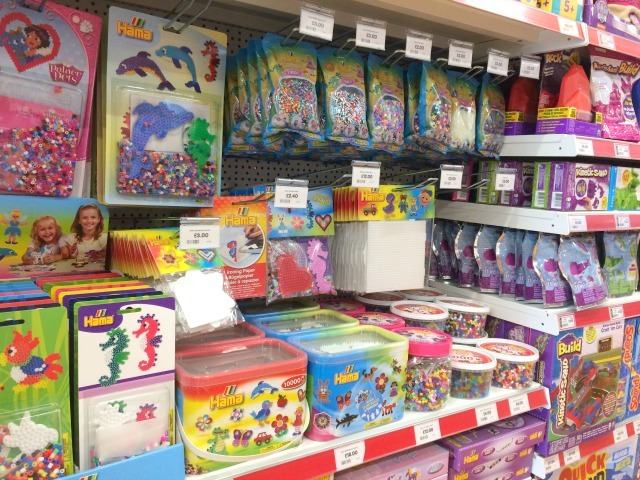 Then I spotted a fantastic Orchard Toys section at the back of the store – we have a few of these and now the twins are getting older we can actually play them rather than just spreading the pieces around the house. 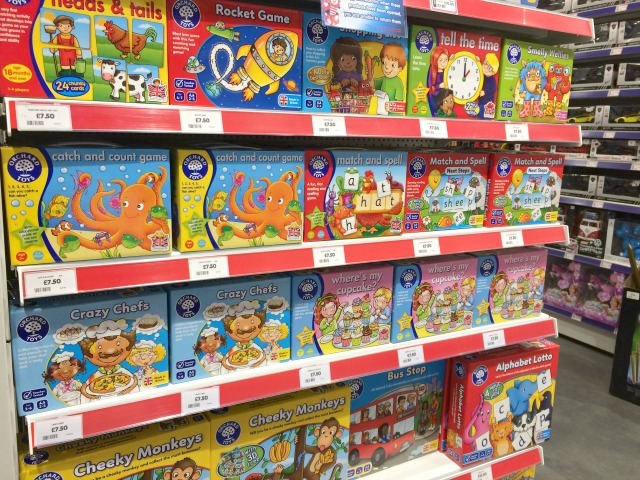 It was great to see the range of games in the shop and have a proper look at them. 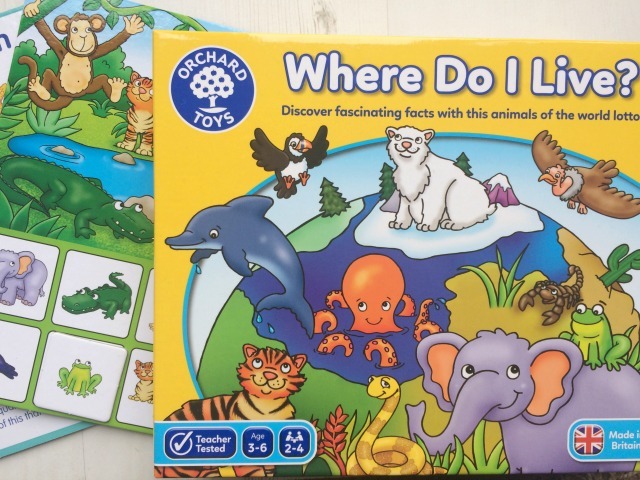 I had to get ‘Where Do I Live?’ for my animal crazy kids. I hadn’t seen it anywhere before and it’s been such a hit with the boys – in fact it didn’t even make it into the rainy day box. I think they’ve had one of us playing it with them every day since! I also got a couple of Lego packs while I was shopping for home items in Debenhams, you can never go wrong with Lego. I like these mini ones, they come with an inspiration booklet and although they’re in the box at the moment I might keep them to use if we’re eating out or visiting family. Lastly I picked up a couple of toys from the value section, I noticed Debenhams had a pocket money section too which I love. When you have to buy three of everything it’s so much easier to pick out a few small things and kids always seem to enjoy them just as much as any expensive toys. 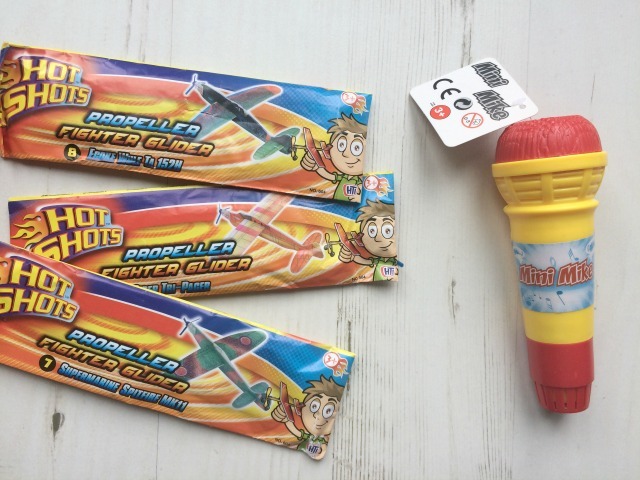 I bought a few plane gliders and toy microphones – as I thought, they were the first things to boys pulled out to play with. The verdict from the kids? It’s been a hit! They’ve starting asking to get it out if we’re in the house for the day. I don’t put everything in it at once so I can change things round. I’ve also found it means I sit down and do something focused with them. It’s a lovely way to spend a rainy day. 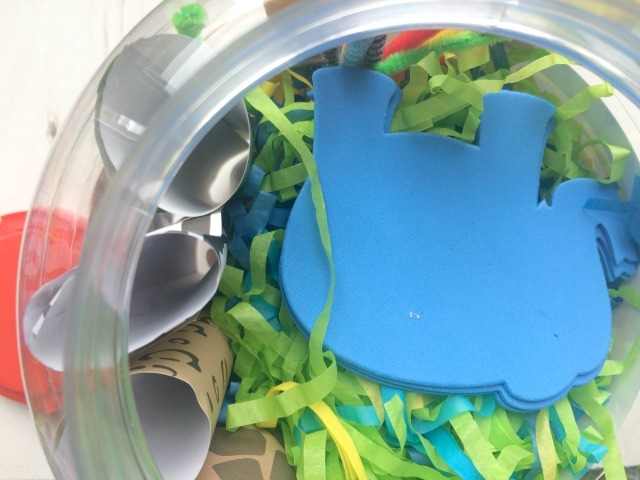 Love this idea, we have a rainy day box too but to be honest it’s currently looking pretty bleak. I definitely need to invest in some new activities and these look fab! !